We raise the financial and ethical issue of paying for getting papers published in professional journals. Indian researchers have published more than 37,000 papers in over 880 open access journals from 61 countries in the five years 2010-14 as seen from Science Citation Index Expanded. This accounts for about 14.4% of India’s overall publication output, considerably higher than the 11.6% from the world. Indian authors have used 488 OA journals levying article processing charge (APC), ranging from INR 500 to US$5,000, in the five years to publish about 15,400 papers. The research paper jointly authored by Muthu Madhan, Siva Shankar Kimidi, Subbiah Gunasekharan, and Subbiah Arunachalam was published in the Indian Institute of Science Repository on October 29, 2016. More than half of these papers were published in just 13 journals. PLoS One and Current Science are the OA journals Indian researchers use most often. Most leading Indian journals are open access and they do not charge APC. Use of OA journals levying APC has increased over the four years from 242 journals and 2557 papers in 2010 to 328 journals and 3,634 papers in 2014. There has been an increase in the use of non-APC journals as well, but at a lower pace. About 27% of all Indian papers in OA journals are in ‘Clinical Medicine,’ and 11.7% in ‘Chemistry.’ Indian researchers have used nine mega journals to publish 3,100 papers. We estimate that India is potentially spending about US$2.4 million annually on APCs and suggest that it would be prudent for Indian authors to make their work freely available through interoperable repositories, a trend that is growing significantly in Latin America and China, especially when research is facing a funding crunch. We further suggest bringing all Indian OA journals on to a single platform similar to SciELO, and all repositories be harvested by CSIR-URDIP which is already managing the OA repositories of the laboratories of CSIR, DBT and DST. Such resource sharing will not only result in enhanced efficiency and reduced overall costs but also facilitate use of standard metadata among repositories. Journals make papers open access in two ways: OA journals make all papers open access immediately on publication, and hybrid OA journals make selected papers open access. Most OA journals listed in the Directory of Open Access Journals (DOAJ) do not charge to make a paper open access. Current Science is such a journal. Many OA journals – about 26% according to Solomon and Björk4 – and all hybrid OA journals levy an article processing charge (APC) to provide OA to a paper. However, according to Crotty,5 the majority of OA papers are published by paying an APC. The APC levied by journals used by Indian researchers is in the range INR 500 (~US$8) - US$5,000. Repositories, where full texts of research publications are deposited and made available online, are of two kinds: central repositories, such as arXiv, and distributed (or institutional) repositories, such as the University of Southampton institutional research repository, <eprints.soton.ac.uk>, the first of its kind. Here we are concerned only with the open access journals which make all content open access immediately on publication. Further, our interest is in papers from India that are published in journals levying APC. The question we are particularly interested in is, ‘is paid open access affordable for India?’ And, even if it is affordable, should we go for it? We assessed the current status of the use of OA journals by Indian researchers using bibliometric analysis of data gathered from Web of Science – Science Citation Index Expanded (SCIE). We used this analysis to find out the number of papers Indian researchers have published in OA journals charging APC, leading to an estimate of the amount the country as a whole would potentially have spent on APC costs, and to see if publishing in paid OA journals led to higher levels of citations. ATLAS, ALICE, STAR and FAITH), and appearing in journals such as Physics Letters B, New Journal of Physics, Nuclear Physics B and BMC Musculoskeletal Disorders, had a very large number of authors (running to several hundreds). We removed them from the data set as they hindered processing the data. Thus we considered 37,078 papers. We downloaded full bibliographic data for all these and analysed the data using Visual FoxPro and found that Indian researchers have used 881 OA journals in which to publish these papers. We visited the web site of each of these journals during January- February 2016 to find out information on APCs levied by them. Also we classified the journals into 22 major field categories following the Essential Science Indicators (ESI) classification. This classification does not allocate journals to multiple fields. We identified papers in which at least one author was from a country other than India. Using the same strategy as used for Indian publications, we recorded the number of papers published by 12 other countries and the proportion of OA papers (data gathered on 29 January 2016). authors and will soon be presented in a report. Center on Health Sciences Information recognized the need for strengthening the visibility of the Brazilian journals, and initiated the SciELO movement in the state of São Paulo, Brazil, in 1997, which later spread to Chile and the rest of Ibero-America and South Africa.8 As Vessuri et al.9 have pointed out, a strong sense of public mission among Latin American universities, coupled with the realization that OA improves the presence and impact of Latin American research publications led Latin America to develop its own knowledge exchange mechanisms on its own terms. Use of journals charging APC - In 2010, Indian researchers had published their work in 479 OA journals, of which 237 did not charge APC. The number of OA journals used by Indian researchers to publish their work is increasing (Table 1). It has risen from 445 in 200913 to 611 in 2014. More than half of the 611 journals levy APC. Crotty’s observation that the majority of OA papers are published by paying an APC,5 Indian authors publish a larger number of papers in non-APC journals. However, papers published in journals levying APC are cited a larger number of times on average. The APC OA journal used most often by Indian researchers in the five-year period is PLoS One with a total publication count of 2,404 and average cites per paper (CPP) of 7.32. Starting with 78 papers in 2009,13 the number increased to 724 papers from India in 2014. Indeed, Current Science, which comes next in the list with 2,334 papers with a CPP of 1.74, was the leader until 2011. Overseas collaboration - All authors are from India in 30,152 of the 37,078 papers published by Indian researchers in the 881 OA journals; this includes papers in which all authors are from the same institution as well as papers with authors from more than one Indian institution. These papers have been cited 78,722 times for a CPP of 2.61. There are 6,926 papers with at least one author from an address outside India, and these have been cited 39,031 times for a CPP of 5.63. Indian researchers have collaborated with authors from some 115 countries. Collaborators are mainly from USA (2,191 papers), UK (815 papers) and Germany (708 papers). 675 papers in 54 Brazilian OA journals of which nine levy APC, 229 papers in 9 Chilean OA journals of which two levy APC, 231 papers in 14 journals published from China of which five charge APC in the five yeras. In these five years Indian authors have published 652 papers in seven Nigerian APC journals. Of these, all but one were delisted from Web of Science after a few years of coverage. Such delisting is all too common. Of the 881 journals studied here, only 263 have been used by Indian researchers in all five years. Citations to papers published in journals levying APC – Number of papers by Indian researchers in 57 journals charging APC and publishing at least 10 papers from India and has a CPP of not less than 10 are listed in Table 2. Table 3 lists the 10 journals that do not levy APC and have been cited at least 10 times on average in the five years. Three journals, viz. Nucleic Acids Research, PLoS Neglected Tropical Diseases, and BMC Genomics, all of which charge an APC of well over US$2,000, have published more than 100 papers from India. 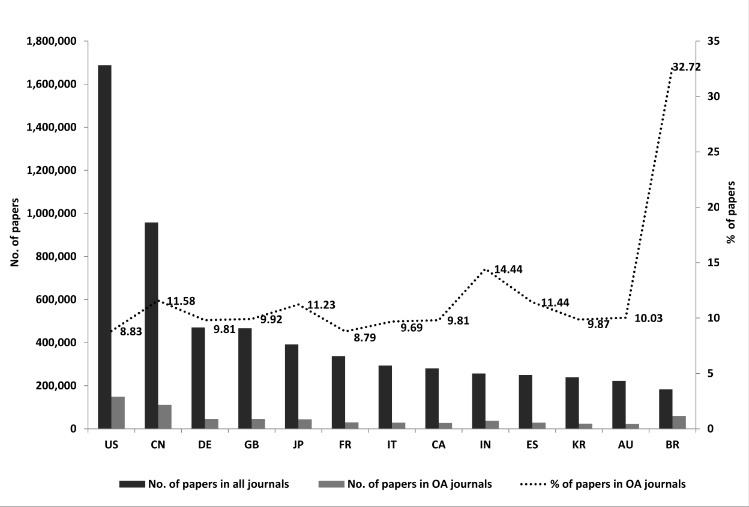 In all three journals, CPP of Indian papers are less than CPP of the journal as a whole, and there is a big difference between the CPP of papers written solely by Indian authors and that of those written in collaboration with foreign authors. For example, Nucleic Acids Research has published 138 papers from India (CPP 14.09) out of a total of 6,614. The journal’s average CPP for the 5-year period is 25.29 as against India’s CPP of 14.09. The 80 papers entirely written by Indian researchers has a CPP of less than 10, and the CPP of the 58 papers with foreign collaborators is more than 22. As many as 92 papers have appeared in 10 OA journals which do not charge APC, none of which are from India, and these have been cited more than 15 times on average. Of the 92 papers, 41 were published in the Bulletin of the World Health Organization at a CPP of about 12.5. In contrast, the CPP of the 478 papers published in the journal during the five years is above 15. Use of mega journals- Indian authors have published 3,100 papers in nine mega journals where the papers are accepted without applying the usual standards of strict peer review if they are perceived to be technically sound (Table 4). Papers classified by field - It is in Clinical Medicine that Indian researchers have published in the largest number of OA journals (208) as well as contributing the largest number of papers (10,036). They have published in 88 journals in the field of Plant and Animal Science, but have published a much larger number of papers in both Chemistry and Biology & Biochemistry in a smaller number of journals. Scopus is likely to have indexed a larger number of such papers. Additionally, there are papers published in hybrid OA journals and papers published in non-OA journals that are made open access by placing them in institutional or central repositories or freely available through author websites, which indicates that there is a welcome growing awareness of the need for making one’s work OA. Our earlier study13 has revealed that some 16% of Indian papers were pulished in OA journals indexed in SCIE 2009, but in that study we had considered all categories of papers from OA journals collected comprehensively from various sources. We estimated the total APC for all 14,293 papers published by Indian authors in OA journals charging a fixed APC (leaving out 7% of all OA papers charging variable APC). We found there is an average cost of ~ US$1,173 per paper. We compared this figure with the costs on APCs incurred by institutions elsewhere. From a survey of a large sample of journals listed in DOAJ carried out in 2014, Morrison et al. 2,727, almost double that chaged by fully OA journals published by non-subscription publishers (such as PLoS), US$ 1,418.19 It is possible that APCs for many papers jointly authored with foreign collaborators might have been paid by the other party. Also, in some cases authors might have been granted either a fee waiver or a discount. Allowing for these possibilities, we may assume that the sum spent would still be very high, more than ~US$12 million, or an average of US$2.4 million a year. This amount is in addition to the national expenditure on its academic and research library budget. Data releaesed early this year as part of the Natioanl Institutional Ranking Framework (https://www.nirfindia.org/Ranking) exercise reveal that the academic and library budget is by no means small. As early as 1999, Rosenzweig27 pointed out that the world of knowledge was being “kidnapped and held for ransom” by commercial publishers who have “turned renegade, exiling themselves from the academic enterprise, and focusing entirely on making the most money for their stockholders” and in the process “restricting the flow of knowledge.” Laakso and Björk have pointed out that today commercial publishers are the most common publisher of OA papers and the number of papers published by them jumped from 13,400 in 2005 to 119,900 in 2011.28 Björk and Solomon19 have shown that “among the established OA publishers with journals listed in Scopus, the average APC grew by about 5% a year over the two years 2012 – 2013.” Taking such increases into account, India’s APC bill is bound to grow far beyond the US$2.4 million in the future. These cost increases are unpredictable, making it difficult for organizations willing to pay APC to make appropriate provisions in their budgets. Should Indian researchers spend a large sum on APCs? The question, from the point ofview of authors, is, “is it all right to spend huge sums for getting papers published in OA journals?” No, says Balaram, former director of Indian Institute of Science. He believes that Indian researchers should not use government funds – money given for research - to subsidize non-Indian journals, and that the money spent on APCs could be better spent on research per se or on libraries.36 Williams-Jones and colleagues belive that “for many sectors of academe, ‘paying to publish’ is ethically suspicious.37 Such an ethical concern has also been raised by Wilson and Golonka.38 There are other voices from the global South opposed to OA through APC. Babini of the Latin American Social Science Council asserts that paying huge sums as APC could increase the overall costs of research and financially undermine a nation’s research and scientific publishing ecosystem.39 Nilsen says paying to publish represents a new apartheid system, and that “we need to move away from a system where someone decides who should have access to what.”40 For the sake of the global public good, Nilsen recommends that we should abandon the discriminative APC-based publishing practice and adopt open access through repositories. The APC model of OA is not serving the true purpose of OA, which aims to create a level playing field for access to research. The APC levied by PLoS Biology and PLoS Medicine is roughly equal to half of a month’s salary for an assistant professor in the United States, but more than two months of salary for an assistant professor in India. What is the alternative model for making research OA? What is happening in India? There are many OA journals in India, and 337 have been listed in DOAJ (as on 3 September 2016). These include journals published by leading Academies, societies and government organizations such as CSIR-NISCAIR, DESIDOC, ICMR, and ICAR, and these are free to authors and readers. MedKnow, although part of a private publishing group, publishes a large number of OA titles, most of which again are free to both authors and readers. But not all Indian OA journals are on a single platform like SciELO. Apart from a few exceptions like MedKnow journals, others do not offer all the web features and metrics that leading publishers offer, which is surprising considering the wealth of technological skills available in the country. Bioline International, told us “Within a single month in 2016, some 1.5 million full text articles were downloaded – equivalent to approximately 18 million per annum – showing the value attached to publications resulting from research carried out in regions of the global south, often referred to as ‘the missing science’, but nevertheless essential to achieve a global understanding in such areas as health and the environment.” (Personal communication, 13 April 2016). URDIP, Pune, has set up a central platform for OA repositories and harvesting from all three organizations and these could be accessed at http://www.csircentral.net/ and http://sciencecentral.in/. Unfortunately, many laboratories under these apex bodies have not taken the OA policy seriously, nor there seems to be any will on the part of the apex bodies to implement the policy forcefully.These repositories are interoperable and have adopted the best international practices. ICAR also has an open access policy, but it does not seem to have much traction.50 There are also many institutional repositories (listed in http://roar.eprints.org/), some of them well populated, but others are languishing, largely due to the indifference of scientists. (www.redalyc.org) which hosts, 1,095 journals. Of these more than 2,300 journals, 1,300 do not charge APC and others charge only a modest fee.53 A SPARC report says, “SciELO and Redalyc do raise the visibility and accessibility of the journals they host, particularly with their local communities. These types of networked meta-publishers allow for central governance of policies, procedures and controls, but are intentionally decentralized to support the development of local capacity and infrastructure ensuring greater sustainability and alignment with local policies and priorities.”54 With these efforts, Latin America has become a model for affordable OA journal publishing. Compared with developments in Latin America and China, India is clearly lagging behind in making her research freely accessible. How can this be changed? We believe that making all research freely accessible through interoperable OA repositories is the ideal solution. According to Houghton and Swan, 56 till the time we reach an all Gold OA (OA through journals) world, Green OA (OA through repositories) may well be the most immediate and cost-effective way to support knowledge transfer and enable innovation across the economy. We suggest the following actions. Populate OA repositories that are already there, as empty and sparsely populated repositories will not reflect well on the research community. Set up repositories in institutions where one does not exist. Academic and research librarians can play an important role in setting up and populating repositories. Academic and research organizations (at the state and central levels, as well as apex bodies), which do not have an OA policy, should adopt a policy similar to those of DBT, DST and CSIR and implement the same. As part of the implementation, funding agencies and heads of organizations should have a compliance monitoring mechanism that would reward those who deposit their papers, and persuade those who do not. Funding agencies and research organizations that are so far unconcerned about their funds being used to meet APCs should stop supporting this practice. A cadre of scholarly communication workforce should be developed for building institutional repositories and persuading researchers to upload materials. If, instead, researchers continue to pay publishers exorbitant APCs, as Poynder points out, there will soon be a crisis over the cost of APCs, which would hit research the world over, but research in the developing world will be hit harder.60 As long as we continue to use APC based journals, we cannot expect to make access to research affordable to all. We are grateful to Peter Suber and Ms Barbara Kirsop for their valuable comments. Poynder, R., The subversive proposal at 20, an interview with Stevan Harnad, Open and Shut, 2014; http://poynder.blogspot.in/2014/06/the-subversive-proposal-at-20.html (accessed on 22 March 2016). Crotty, D., Is it true that most open access journals do not charge an APC? Sort of. It depends. The Scholarly Kitchen, 2015; http://scholarlykitchen.sspnet.org/2015/08/26/domost-oa-journals-not-charge-an-apc-sort-of-it-depends/ (accessed on 22 March 2016). Morrison, H., Dramatic growth of open access, 31 March 2016, The Imaginary Journal of Poetic Economics, http://poeticeconomics.blogspot.in/2016/04/dramatic-growth-of-openaccess-march-31.html (accessed on 13 April 2016). http://road.issn.org/en/statistics (accessed on 13 April 2014). Adams, C., Open access in Latin America: Embraced as key to visibility of research, http://www.sparc.arl.org/news/open-access-latin-america-embraced-key-visibilityresearch-outputs (accessed on 23 March 2016). 10. Elsevier, Scopus content, 2016; http://www.elsevier.com/__data/assets/excel_doc/0003/148548/title_list.xlsx (accessed on 22 March 2016). 11. Turner, J., Opening up to open access research and publishing, 2015; http://stateofinnovation.thomsonreuters.com/opening-up-to-open-access-research-andpublishing (accessed on 22 March 2016). 13. Gunasekaran, S. and Arunachalam, S., Use of open access journals by Indian researchers, Sci., 2011, 101, 1287-1295. 15. Wellcome Trust, Wellcome Trust and COAF Open Access Spend, 2014-15, 2016; http://blog.wellcome.ac.uk/2016/03/23/wellcome-trust-and-coaf-open-access-spend-2014-15/ (accessed on 24 March 2016). 16. Research Councils UK (RCUK), Review of the implementation of the RCUK Policy on open access, 2015; http://www.rcuk.ac.uk/RCUKprod/assets/documents/documents/Openaccessreport.pdf (accessed on 22 March 2016). 17. Independent review of the implementation of RCUK policy on open access: Evidence from the University of Leeds; http://www.rcuk.ac.uk/RCUKprod/assets/documents/oadocs/UniversityofLeeds.pdf (accessed on 22 March 2016). 19. Björk, B. and Solomon, D., Developing an effective market for open access paper processing charges, 2014; http://www.wellcome.ac.uk/stellent/groups/corporatesite/@policy_communications/docu ments/web_document/wtp055910.pdf (accessed on 22 March 2016). 20. Gerritsma, W., The costs for going gold in the Netherlands, WoW! Wouter on the Web, 2014; http://wowter.net/2014/03/05/costs-going-gold-netherlands/ (accessed on 22 March 2016). 23. Poynder, R., The OA Interviews: Michael Eisen, co-founder of the Public Library of Science, Open and Shut, 2012; http://poynder.blogspot.in/2012/02/oa-interviewsmichael-eisen-co-founder.html (accessed on 22, March 2016). 24. Wheatly, S., Comparison of BioMed Central APCs from 2010-2016, Sustaining the Knowledge Commons, 2016, https://sustainingknowledgecommons.org/2016/04/13/comparison-of-biomed-centralapcs-from-2010-2016/ (accessed on 15 April 2016). 25. Starczewsk, M., Open Access will remain a half revolution, CEON Otwarta nauka, 2016; http://otwartanauka.pl/in-english/experts-on-open-access/open-access-will-remain-a-halfrevolution-interview-with-richard-poynder (accessed on 22 March 2016). 26. SCOAP3 – Sponsoring Consortium for Open Access Publishing in Particle Physics; https://scoap3.org/scoap3journals/ (accessed on 22 March 2016). 27. Rosenzweig, M.L., Protecting Access to Scholarship: We are the Solution,2000; http://www.evolutionary-ecology.com/citizen/spring00speech.pdf (accessed on 27 March 2016). 29. Journal declarations of independence, Open Access Directory; http://oad.simmons.edu/oadwiki/Journal_declarations_of_independence (accessed on 27 March 2016). 30. Greenberg, J., Editors of the journal Lingua protest-quit in battle for open access, Wired, 2015; http://www.wired.com/2015/11/editors-of-the-journal-lingua-protest-quit-in-battlefor-open-access/ (accessed on 22 March 2016). 31. Gowers, T., Discrete Analysis- an arXiv overlay journal, Gower's Weblog, 2015; https://gowers.wordpress.com/2015/09/10/discrete-analysis-an-arxiv-overlay-journal/ (accessed on 22 March 2016). 33. Belluz, J., This renowned mathematician is bent on proving academic journals can cost nothing, Vox, 2016; http://www.vox.com/2016/3/4/11160540/timothy-gowers-discreteanalysis (accessed on 27 March 2016). 36. Jayaraman, K.S., Q&A: Open archives - the alternative to open access, net, 2008; http://www.scidev.net/global/communication/feature/q-a-open-archives-the-alternativeto-open-access.html (accessed on 22 March 2016). 37. William-Jones, Pipon, J-CB. , Smith, E. and Boulanger, R., Ethical challenges of open access publishing – For many sectors of academe, ‘paying to publish’ is ethically suspicious, 2014; http://www.universityaffairs.ca/opinion/in-my-opinion/ethicalchallenges-of-open-access-publishing/ (accessed on 22 March 2016). 38. Wilson, D. A. and Golonka S., The high price of open access, Notes from Two Scientific Psychologists, 2016; http://psychsciencenotes.blogspot.in/2016/03/the-high-price-ofopen-access.html (accessed on 22, March 2016). 40. Nilsen, R., Europe’s open access champions; http://openscholarchampions.eu/champions/fightacademicapartheid/ (accessed on 27, March 2016). 41. CNR Rao warns govt: Funds drought may push scientists out of science, The Indian Express, 8 November 2015; http://indianexpress.com/paper/india/india-news-india/cnrrao-warns-govt-funds-drought-may-push-scientists-out-of-science/#sthash.l7kqwllJ.dpuf (accessed on 22 March 2016). 42. Krishnan, V., Fund crunch has hit research in 32 institutions: ICMR chief, The Hindu, 15 January 2016; http://www.thehindu.com/news/national/fund-crunch-has-hit-research-in-32-institutions-icmr-chief/paper8108880.ece (accessed on 22, March 2016). 43. Malhotra, A., IIT-K faces fund crisis, demands for more grant from Ministry of HRD, 13 March 2016, Times of India; http://timesofindia.indiatimes.com/city/kanpur/IIT-K-facesfund-crisis-demands-for-more-grant-from-Ministry-of-HRD/papershow/51380722.cms (accessed on 22 March 2016). 44. Krishnan, V. and Peri, D., Govt. tells labs: fund research by yourself, The Hindu, 28 October 2015; http://www.thehindu.com/news/national/govt-tells-labs-fund-research-byyourself/paper7811265.ece (accessed on 22, March 2016). 46. Joshi, N. V., Institutional E-print Archives: Liberalizing Access to Scientific Research, Sci., 2005, 89, 421-422; http://www.currentscience.ac.in/Downloads/download_pdf.php?titleid=id_089_03_0421_0422_0 (accessed on 27 March 2016). 47. Poynder, R., Where are we, what still needs to be done? Stevan Harnad on the state of Open Access, Open and Shut, 2013; http://poynder.blogspot.in/2013/07/where-are-wewhat-still-needs-to-be.html (accessed on 27 March 2016). 48. CSIR open access mandate; http://www.csircentral.net/mandate.pdf (accessed on 27 March 2016). 49. DBT-DST open access policy, 2015; http://dst.gov.in/news/dbt-dst-open-access-policy (accessed on 27 March 2016). 50. ICAR adopts open access policy; http://icar.org.in/en/node/6609 (accessed on 27 March 2016). 52. Liping, K., Open access and open research data in china, eifl blog, 2016; http://www.eifl.net/blogs/open-access-and-open-research-data-china (accessed on 27, March 2016). 53. Babini, D., Repositories as key players in non-commercial open access - a developing region perspective, COAR-SPARC conference, 15-16 April 2015, Portugal; http://www.slideshare.net/CLACSOredbiblio/repositories-as-key-players-innoncommercial-open-access-a-developing-region-perspective (accessed on 24 March 2016). 54. SPARC, Open Access in Latin America: a paragon for the rest of the world, 2015, SciELO in perspective; http://blog.scielo.org/en/2015/08/18/open-access-in-latinamerica-a-paragon-for-the-rest-of-the-world-originally-published-in-the-sparc-blog/(accessed on 27 March 2016). 55. Starczewski, M., and Referencia, L.A., – South American Open Science network, ceon Otwarta Nauka, 2015; https://otwartanauka.pl/analysis/nauka-otwartosc-swiat/lareferencia-poludniowoamerykanska-siec-otwartej-nauki/la-referencia-south-americanopen-science-network?showall=1&limitstart= (accessed on 27, March 2016). 57. Scholarly Publishing and Academic Resources Coalition,Open Access and Research Funders: A Report on Challenges, Opportunities, and Collaboration, 2016, http://sparcopen.org/wp-content/uploads/2016/04/RWJF-SPARC-public-report.pdf (accessed on 15 April 2016). Figure 1. Share of papers published by different countries in open access journals indexed in SCIE, 2010-2014. * Data gathered on 29 February 2016. Great Britain includes England, Scotland, Wales and Northern Ireland. *Only articles, letters, proceedings papers, and reviews are considered.